This perfectly balanced blend of rosehip with hibiscus creates an exquisitely fruity whilst deliciously sweet infusion that is also naturally caffeine free. 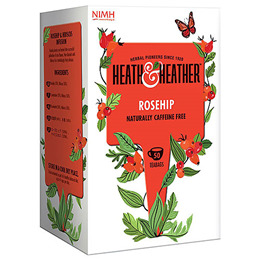 Below are reviews of Heath & Heather Rosehip Tea - 50 Bags by bodykind customers. If you have tried this product we'd love to hear what you think so please leave a review. Excellent product! I am delightfully pleased with the purity and delicious taste of this very healthy tea combination. Have had this for breakfast for many years and still as good as ever. This perfect balanced blend of rosehip with hibiscus creates an exquisitely fruity whilst deliciously sweet infusion that is also naturally caffeine free.